A new era brings a new opportunity to update and revise Quilts! Quilts!! Quilts!!! 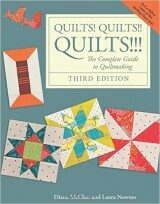 into its third edition and make it available once more to today’s quilters. Quilting has always been our passion as we are constantly on the lookout for simple, classic patterns that we can bring to life with fresh, contemporary fabrics. With simplicity in mind, we have chosen patterns that will be successful for quilters with varying skill levels while conveying the spirit of creativity that makes each newly made quilt so valuable. Our own homes are filled with quilts; some we made from our books, some we collected, some we received as gifts. All are filled with special stories and memories. Quilts uplift the soul and can make us feel happy, excited, tranquil, and at peace. Quilts can also form friendships and bind us to one another. For a party, we might hang quilts in the garden to set the stage for fun and conversation. On cold days, we snuggle up in quilts with our children and even our pets. A beautiful quilt in the guest room provides a warm welcome for a friend who has been missed. We announce an engagement of the bride and groom with a special quilt that celebrates the beginning of their marriage and will always remind them of their love for each other. When a newborn comes into this beautiful world, there is always a pretty little quilt to wrap the baby up safe and warm. Dear readers, it is with the same feelings of love and joy that we share with you our passion for quilts. We offer our experience and expertise to help you enjoy this wonderful art form, which is one of the most rewarding and creative experiences life offers. Whether you use your quilts as bed covers, picnic cloths, to hang from the porch rail on sunny days, or as gifts for friends or charities, may the joy of quilting fill your home and those of the people you love.